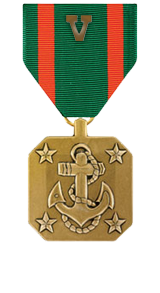 Heroic achievement in the superior performance of his duties while serving as 2d Squad Leader, 2d Platoon, Company I, 3d Battalion, 3d Marines, Regimental Combat Team-7, I Marine Expeditionary Force Forward, from March to September 2006, in support of Operation IRAQI FREEDOM. On 21 July 2006, Sergeant Ramos’ squad came under enemy sniper fire. As a result of his quick thinking and accurate assessment of the situation, his squad was able to safely egress from the area. Throughout the deployment, Sergeant Ramos led over 200 dismounted combat patrols, mounted patrols and numerous cordon and searches in which 2d Squad detained over 19 known or suspected insurgents. Sergeant Ramos also trained and mentored members of the Iraqi Army in mission planning, patrolling techniques and weapons employment. Sergeant Ramos’ contribution towards training the Iraqi Army by using his personal knowledge and training techniques significantly enhanced their ability to plan and conduct independent operations. Sergeant Ramos’ initiative, perseverance and total dedication to duty reflected credit upon him and were in keeping with the highest traditions of the Marine Corps and the United States Naval Service.